Ever feel self-conscious about smiling because you needed braces as a kid, yet never had them? Maybe you’re in a business meeting and you’d like a little more confidence as you close that deal. With today’s dental technology, you can say goodbye to that wonky smile without having to endure traditional braces and without anyone knowing you’re going through orthodontic treatment. If it’s to close a gap in your front teeth or fix a misaligned smile, you’ll discover why many of your neighbours in the Melbourne area have chosen Dental on Clarendon and clear aligners to get that awesome smile they deserve. Clear Braces – What Are They? Invisalign is a well known and popular brand that has been used on millions of patients just like you who wanted to fix their smile. How Is It Different Than Brackets and Wires? Traditional braces consist of brackets glued to your teeth, connected with wires that help move your teeth into the desired position. Invisalign is a set of custom-designed removable clear aligners that slip on over your teeth. Similar to braces, they gradually align your teeth to the right position. The trays are transparent, which means your treatment often goes unnoticed. Your co-workers and friends probably won’t even notice your teeth are being straightened. As an added bonus, because there are no brackets and wires, you won’t have the dreaded issue of food stuck in your braces. Will Invisalign Really Straighten My Teeth? Adults, as well as teens, are choosing Invisalign. There’s no doubting how self-conscious teenagers are, so clear orthodontic correction helps them gain healthy smiles without the potential embarrassment of bracket and wire braces. 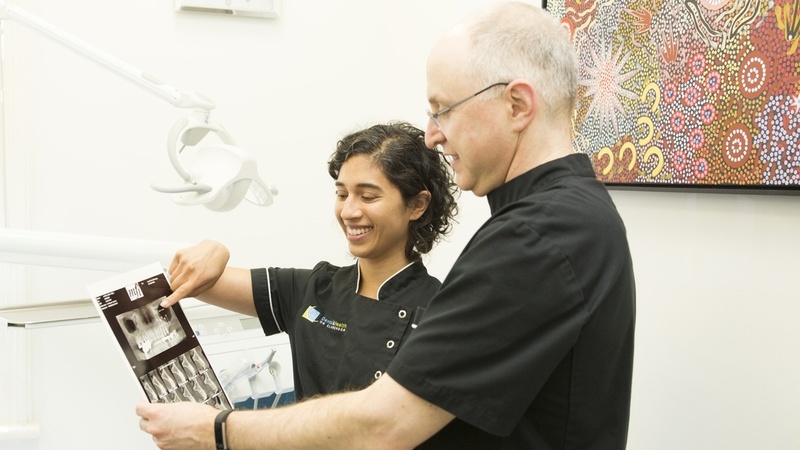 If your child is attending a secondary school like Albert Park College or St Michael’s Grammar or Melbourne Grammar School, if you look hard enough, you may just see dozens of teenagers with Invisalign. You may even see some teachers wearing them too! We not only love to see our South Melbourne locals with brighter smiles, but welcome anyone to Dental on Clarendon who is considering Invisalign! The best candidates for this kind of treatment are teenagers and adults. It is not recommended for primary school aged children because their teeth are still growing and straightening their teeth is more complex. Invisalign is best used to correct gaps in your teeth and minor to moderately crowded teeth. If you have a more complicated issue, for example including severe overbite or under-bite, we’ll recommend you proceed with the more traditional type of orthodontic correction. Do I Need My Teeth Fixed? A well-aligned smile does wonders for self-confidence. However, orthodontic treatment isn’t just about looking like a movie star – it also helps to preserve overall oral health! For example, crowded teeth are harder to keep clean. Your toothbrush and floss may not reach all of the surfaces of your teeth, which can encourage cavities and plaque build-up. If you can’t maintain the health of your teeth properly, it might lead to periodontal disease, which has been associated with long-term health issues such as cardiovascular problems and diabetes. One of our experienced dentists will have a detailed look at your teeth and create a treatment plan. It will include the duration and number of aligners you’ll need. We use the latest and most high-tech equipment from Invisalign, including the proprietary ClinCheck software. While you’re in our clinic, ClinCheck maps out the path to your perfect smile, right down to the tiniest shift, from your first aligner to your brand-new smile. No guesswork, no waiting and seeing! A series of aligners will be custom designed to move your teeth into place. You can expect to get a new aligner every few weeks until your teeth have achieved the desired result. Every few weeks, you’ll visit our office for a quick check up and receive a new aligner. Some patients develop a slight lisp at the beginning of the treatment because your tongue isn’t used to the retainer in your mouth. But it won’t last! The more you talk while wearing the retainers, the quicker you’ll get used to it and the quicker your speech will adjust. Aligners can cause a bit of discomfort while the teeth move within your mouth, especially when you start on a new aligner. That may last for a few days, and then you’ll get used to it. If you have any concerns, talk with our helpful staff about the best ways to deal with this first few days. You get one chance to make a great impression, and a fantastic smile makes you a truly memorable person. Having nice straight teeth makes it a lot easier to break out a big grin. Not only will people notice your brilliant smile, correctly aligned teeth are easier to keep clean and healthy. Being able to properly brush and floss will have an enormous impact on your overall health. Do you have an adolescent who’s dreading orthodontic treatment, or are you an adult who couldn’t get orthodontic treatment earlier in life? When you call our office on Clarendon Street, you’ll find that our friendly staff are going to help you get that smile you’ve always wanted. As you read the heaps of 5 star reviews from our current and previous patients, you’ll find yourself agreeing that this is indeed the right dental clinic for you. There are many options for a better smile, and we’re going to make sure you get the best possible treatment. We look forward to speaking with you soon!